Make it super easy for member families to purchase childcare ahead of time. With Check-In Passes they purchase the amount of childcare they need, based on your available options, ahead of time. That makes payment collection easier for you and childcare check-in faster, easier and more convenient for them. Pass options include by number of check-ins, hourly, day, week, monthly. They can be one-time purchases or auto renew. You can create as many or as few pass types as you need. Check-In Passes have tons of flexibility and options. You control and decide what type of pass(es) you want to offer, any limits or restrictions, pricing and renewal options. If necessary, refunds are a snap as well. Organizations simply create a pass by choosing the appropriate type (number of check-ins, hourly, day, week, monthly), add any limits such as number of hours or check-ins associated per day/week/month, and include any other restrictions like it’s valid only certain places or classes. Then set the price and determine if the Check-In Pass is auto-renew or one time only. It’s quick and easy to set up a merchant account right in the system to get started. It’s just as easy for parents, giving them a fast, convenient way to pay for childcare. Parents simply purchase the passes you’ve made available from within their personal KidCheck account and pay via credit card. They can also purchase at your facility at a check-in station. 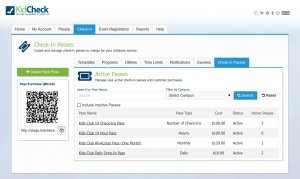 Check-In Passes – Fast, Easy, Flexible childcare payment options.